The primary function of this large Antique Bowl is believed to be ceremonial or ritual in nature, and most probably used for divination by a shaman, although it also has an interesting voice when struck. It is very much one of a kind...heavy, with a wide flat bottom, thick low wall and sheered lip...and highly decorated. The decoration includes a geometric lotus mandala at its centre, a chain of suns (dots surrounded by circles) all the way around the lip, and incised bands encircling the outer rim. A chain of sun motifs is set within the incised bands, with 5 downward pointing triangles of suns at regular intervals around the bowl. A single sun motif is centrally placed on the bottom of the bowl. These motifs are occasionally found on 18thand 19thcentury Thadobati and Manipuri Singing Bowls, but rarely a mandala. The fundamental struck note is a pleasant and interesting third octave G# (202Hz). The rim note is the same when played with a wooden ringer, but is not particularly sweet. All of which tends to confirm the bowls ceremonial or ritual character. 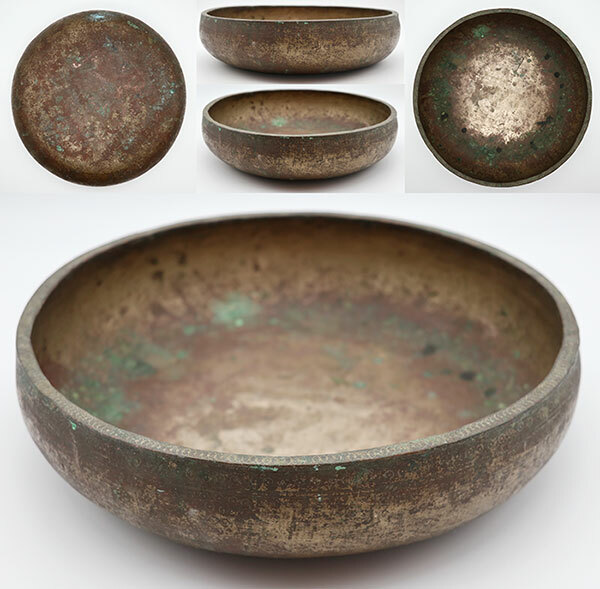 This interesting bowl is offered in its ‘as found’ condition...structurally sound and with all its decorative features intact, but partially obscured by grime, light copper oxidization, and discoloration, most of which could be removed with effort if desired. This is reflected in the much reduced price. A rare and ancient bowl that will perhaps appeal most to collectors and those engaged in shamanic work. A padded striker, and a double-ended teak and suede ringer are included in the price.